Arrive fashionably late. That is how you make an entrance. Let the first groups go through, hog each other’s attention, and then you swing through once they have dissipated… with all of the focus on you! The new HJC RPHA ST Helmet is showing up in just that way. As the younger brother to the HJC RPHA-10, the new RPHA ST has a functionality set much more geared towards the touring crowd, or those who spend great deals of time/miles on the bike. This can be seen in the advanced polycarbonate shell construction that is both lightweight and slim in fitment. The helmet also utilizes the Max Air-flow Top Vent which can allow for variable airflow through glove-friendly controls and an Advanced Channeling Ventilation System for massive amounts of front to back airflow as well. 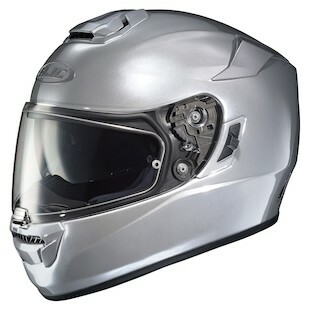 The main feature separating this helmet from the RPHA-10, however, is the incorporation of the internal drop down sun-visor that allows you to ride out in any conditions without worrying about replacement shields. As the touring alternative to the very popular RPHA-10 helmet from HJC, the new RPHA-ST is a solid choice for riders who spend a lot of time in the saddle.